Fitoderm™- Get clear and Blemish free skin naturally!! Fitoderm™ - Get clear and Blemish free skin naturally!! What is Acne and what causes Acne and Pimples? Acne is a term for plugged pores (whiteheads and blackheads), pimples and even larger lumps (cysts or nodules). Hormones and sebum are strongly believed to be the main cause of acne. The hormone surge stimulates the sebaceous glands for mass production of sebum that takes place largely around the face, back and upper chest, right where acne and pimples tend to hit. Stress causes the production of the hormone Cortisol, which can aggravate acne. Drugs like Barbiturates and tetracycline and Anabolic steroids can foster the development of Acne. Why FitoDerm is considered a far better and a more effective acne solution? Fitoderm natural acne care consists of a combination acne management system that uses the finest ingredients that work effectively on pre-existing acne and reduce the frequency of breakouts. Anti-acne care products normally deal your external acne problems; they do not take care of the rest of the skin. In order to have soft skin that is not inflamed and irritated, you need to consume natural supplements that will clean the system from inside out. These ingredients work from within the body thus attacking bacteria that causes acne. FitoDerm natural Acne care, helps your complexion, fades scars, reduces whiteheads, lessens lesions, removes dirt and dead skin from the face, and improves skin texture by smoothing the skin. FitoDerm natural Acne Remedy is guaranteed to work and is one of the best known acne products offering real and quick solutions around. Discover the way FitoDerm Works to a Healthy looking, Acne free skin? There are several creams and pills available that reduce acne breakouts. The ointments you apply work on the pimples first, clean it from above and then enter the blood to purify it. But FitoDerm believes in dealing with the root cause first. This side effect free pill is specially developed to fight acne problems. The potent pills of FitoDerm purify the blood first, which gradually help in cleansing and clearing the skin. Working in such internal manner helps the body to first deal with the toxin and harmful material and then move towards skin affected area. 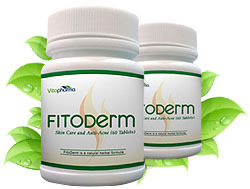 FitoDerm is a combination of herbal compounds and other natural ingredients that deal with skin care. It contains Emblica Officinalis that promotes glowing of skin, Rubia Cordifolia helps gaining shine, thus removing marks. Acacia Catechu enhances healing of wound and Berberis Aristata works in purifying blood.